We luvs our monsters. And some of the favorites of favorites are the serial killers. Perhaps it's because they come close to home, and tap into such basic fears, but slashers have been a major cinematic force for almost 40 years. 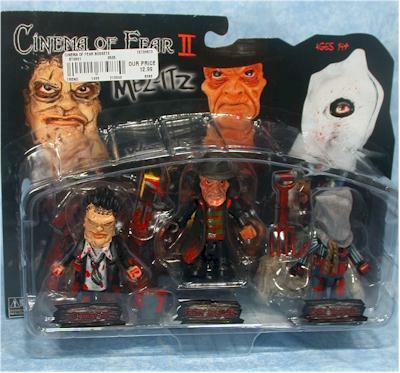 Mezco returns with a second series of their nifty little Mez-itz based on slasher flicks. The first series of Cinema of Fear included the original Leatherface, Freddy from Nightmare on Elm Street, and a very traditional version of Jason. 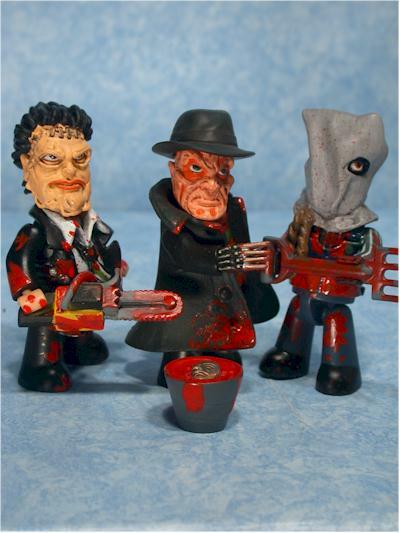 The second set comes with all new versions of these same three characters - Leatherface n his 'formal' wear, Freddy from New Nightmare, and Jason from part 2, where he made his first adult appearance, and still wasn't wearing the hockey mask. I have to warn you in advance - Mez-itz are my favorite of the mini-figures. It looks like only three of the dozen mini-figures used for licensed products that hit the market are really here to stay: Mez-itz, Mini-mates, and Palz. While all three have their pros and cons, it's the Mez-itz that make me smile most. The packaging is the basic cardback/bubble, but it's nicely die cut with some decent graphics and text. It's also very heavy stock, and should hold up to peg wear well. It'll be a bit tough for the MOCers to store, and of course it's not collector friendly, but it's attractive without being too big or overbearing, so they get points for that. There's a goofy, silly, cartoony nature to the Mez-itz that lends itself extremely well to properties that often take themselves far too seriously. These sick slashers are the perfect example. Truly terrifying in their film versions, here they are just so damn cute you want to hug them. I also prefer the sculpted heads used on Mez-itz to the basic block heads of other lines. They allow them to be far more visually interesting and appealing. The sculpts on all three of these are excellent. I could have swore this was Leatherface - and it could pass for him - but I'm told this is our good old original Leatherface from the 'dinner' scene. But just a little. 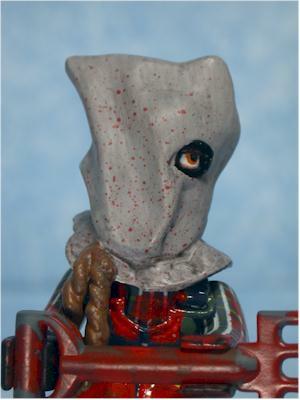 Freddy looks very much like the New Nightmare source material, right down to the style and location of his head trauma, and while Jason is just wearing a sack, it's a very realistic looking sack. They eyes on Jason and Leatherface are most impressive, and it truly appears as though there's a mask over a face below. The small detail work on these figures is top notch, and there's buckets of blood in all the right places. There's little splatters on the hood of Jason, and big splatters on just about everybody's clothes. The smaller details, especially on the faces, is very good. 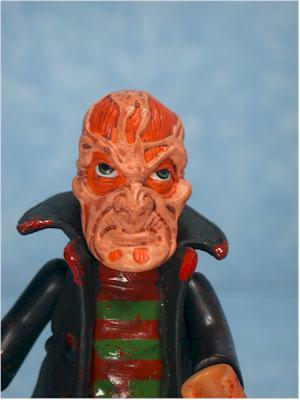 A couple of the eyes are a little wonky, especially on poor Freddy. But most of the lines are clean and neat, with consistent colors and sharp definition between them. The Mez-itz are the most articulated of all the mini-figures, but they have the important stuff. There's a ball jointed neck, and any regular readers now how much I love those ball jointed necks. It doesn't have a terrific range of movement, but it's reasonable. There's also ball jointed shoulders and hips, a waist joint, and cut wrists. 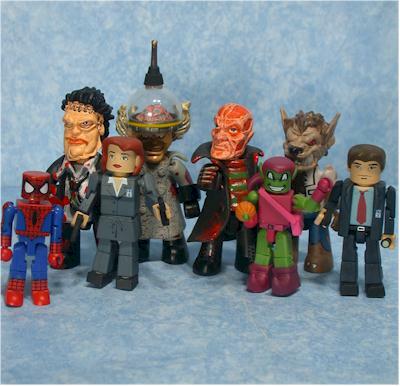 These figures can pop apart like many mini-figures, and you can swap around various parts. Unfortunately, they also tend to pop apart a little too easy, especially at the shoulders and hips. It's not a huge problem, but the impatient may find it a tad frustrating. 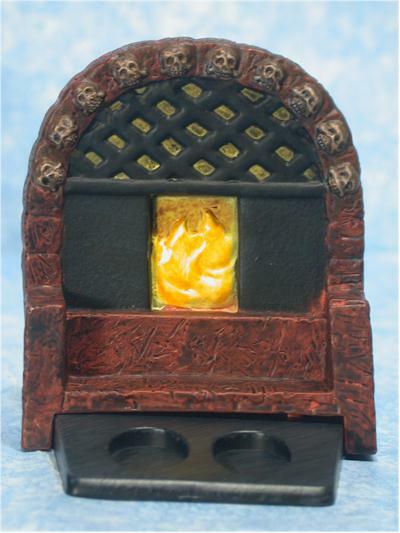 Each of these figures comes with a swanky display base, designed just special for his particular tastes. Leatherface has a set of meat hooks hanging from a beam, with a wooden wall or door for a backdrop to the hooks. 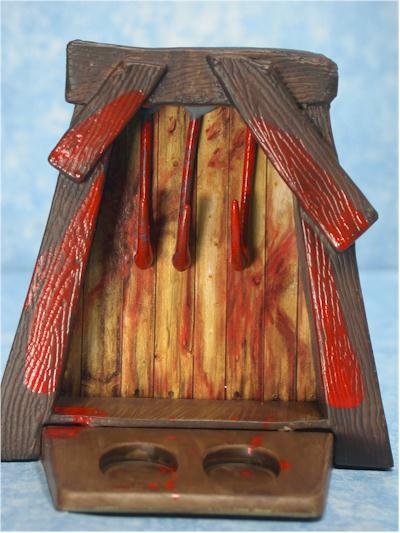 There's lots of blood, and the hooks themselves can be positioned just the way you'd like. Jason has the best of the three bases, with the scene from part 2 involving his mommy dearest. Here we see the shrine, with her lovely head and a number of candles. 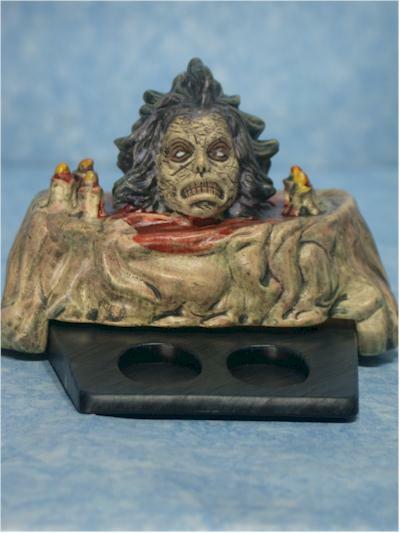 The sculpting on this base is great, and fits in perfectly with the gruesome nature of the film, and the goofy nature of the Mez-itz. Freddy's base is the least exciting but still matches up with the character - it's the front of his furnace, compete with hotly burning fire inside. Each character also has at least one additional accessory. 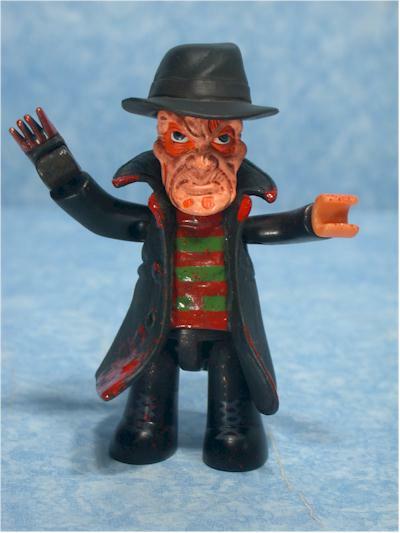 Freddy comes with his hat, which fits tightly and stays on his head well. 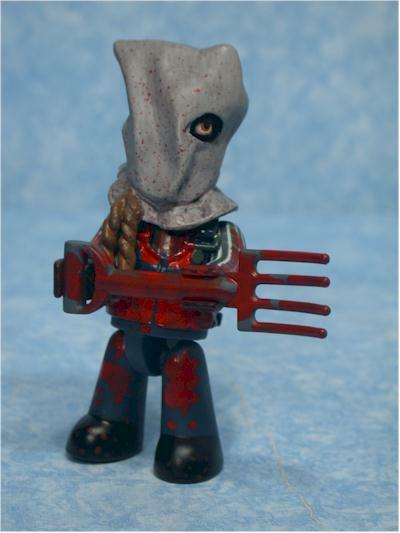 Jason has a blood soaked pitch fork, one of his favorite implements of death. And Leatherface gets extra points because he has not one but two extra goodies - his trademark chainsaw, and a bucket of blood, with a new face floating inside. There's plenty of blood on all the accessories, just as you might expect, and the characters can carry their weapons easily in many different poses. I wouldn't suggest allowing your children to play with serial killers. I'm betting Mr. and Mrs. Menendez wish they hadn't. There's no denying how much fun the basic Mez-itz figures are though, and I'm really hoping that we eventually see the Pirates sets that Mezco has been promising us. Back when the first series came out, they cost around ten bucks for the set of three. That was a good value, my friend. Now, even at $13, they are still a decent price, considering how expensive other mini-figures on the specialty market have gotten. It's hard to find a figure for less than five bucks these days, mini or not. However, if you end up paying closer to $15, you can knock off another half star. No problems here at all. This is another great set of Mez-itz, if they're your sort of thing. For those folks that aren't into the mini-figure style, these won't do much for you. 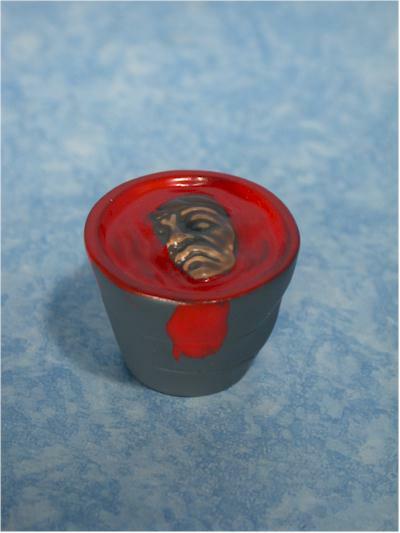 But for the collector of swanky little figures, these will make your bread rise. I'm really hoping we eventually see the pirates and samurai characters that we've seen teaser photos of at previous Toy Fairs. What would be more cool than a bunch of pirate Mez-itz on their huge pirate ship? - Time and Space Toys has the set for $15. - CornerStoreComics has this set (and a ton of the earlier releases of Mez-itz) for $15 as well. - if you like the Mez-itz, you should check out there first and second series of Monsters, and Hellboy. - I also have a guest review up of the first series of Cinema of Fear, a guest review of the Army of Darkness set, and a guest review of the Predator set. - or, if these three serial killers are more your thing, you can find some of their reviews. First, let's talk about Leatherface, since he's the one with the least. 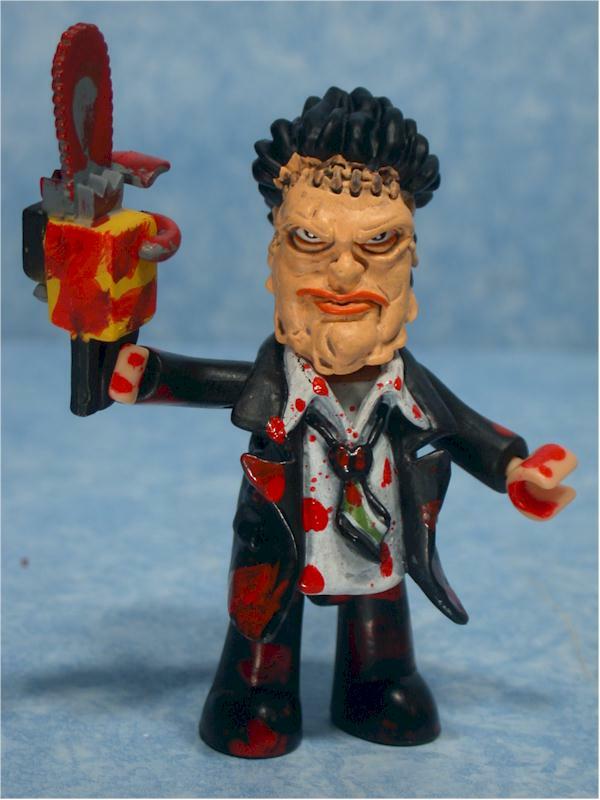 Here's a review of the 12" version of the original Leatherface. 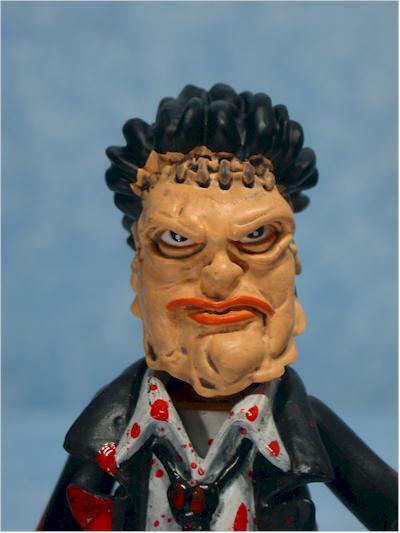 Sideshow has also done a 12" version of the Hewitt Leatherface character. - Freddy has lots of reviews. 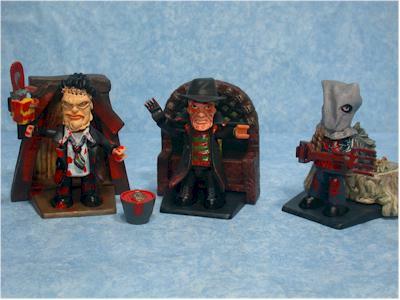 There's the 12" Robert Englund, the 12" version of New Nightmare Freddy, a 12" Freddy from Freddy vs. Jason, the SDCC exclusive Robert Englund Freddy (7"), the 12" original Freddy, and the 8" Freddy from Freddy vs. Jason. And let's also not forget that Sideshow did a Furnace Environment just for their 12" Freddy! - and of course, Jason has plenty as well. You'll see the 12" Freddy vs. Jason in the same review as Freddy, as well as the 8" version of Jason from Freddy vs. Jason. Then there's the 12" Jason from Part 6, the 12" version from part 2, and the 12" Jason from Part 3.